I purchased my Norton Mercury in 1973 to replace my Pre unit 650 Triumph. The Triumph took me on my first foray onto a racetrack at Surfers Paradise when I was a member of the Gold Coast Motorcycle Club. It was a club day and I remember thinking how fast I was going until someone on a 175 Yamaha with knobbies passed me on the inside. Every man and his dog had a Triumph and I lusted after the Norton because it seemed so exotic. To say that the Norton,s handling was a revelation would be a lie because I really don’t think I knew how to ride at the time. After a while I found that I could go around corners faster than before and in retrospect buying the Norton may have saved me from a lot of gravel rash. Unfortunately a lady in a Toyota eventually proved beyond doubt that I was not invincible. Thankfully the bike and myself were both repairable. Track days at Lakeside and regular blasts up and down Springbrook were the next thing. You could rock up on any weekend at Lakeside , pay $10, sign a form and go for your life. Could not happen now. Ian Aitchison, Bob Moorehouse, my old mate Paul Chesher, Derek Fleming and I think Rob Olsen and many more were regulars. A ride around Bathurst at the Easter meeting was always a regular event. You could ride around the track in the morning before racing started. The police would always have a radar trap on Conrod Straight and as it made no difference to your licence in your home state, many riders were quite happy to pay the fine in exchange for the ticket proving how fast they went. Houses, children, work etc intervened and apart from the occasional outing the Norton languished in the shed. 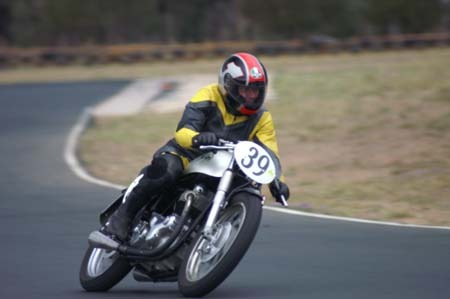 A couple of years ago my son, Sean started racing and so I dragged the Norton out for Stanthorpe 2009. Race preparation mainly involved the following. 1. Remove original headlight, taillight, horn and associated elecctrics. 2. Remove original mudguards, chainguard, seat etc, etc. 3. Replace mufflers with rusty megaphones from shed, replace mudguards with plastic front and chrome rear from shed. 4. Make up rearsets from bits and pieces in shed. 5. Replace seat with Manx style courtesy of my old mate Paul. 6. Fit clipons and make some number plates out of plywood from shed. 7. Take off Honda XR200 carby <that worked really well> and replace with the original spec Amal that Sean bought for me when he was living in England. 8. I have replaced the rings, big end shells etc in the past and they are still doing a great job. 10. Ready to go and apart from some inadvertent modifications at turn 3 at Stanthorpe in July 2010 the bike is standard.